Free Shipping & Tax Free! Shipping on all bathroom kits, macerators & grinders in the lower 48 is FREE via Fed Ex Ground Or Home Delivery, Orders placed prior to 3pm ship the very same day. NH is a Tax Free State so we do not collect Sales Tax. Check out the Interest Free Financing from Paypal Credit at the bottom of the page..
We are not actors, but we have a great YouTube Channel with excellent tips for DIYer's or even Pro's who have never installed before. * Why buy from you as opposed to Amazon, Home Depot or Lowes? We are so different then a big box store, for the most part they are clueless when you start asking questions. We are a family owned stocking distributor, we care about each and every customer and their particular project. When you have a simple question you can easily call us for advice even on the weekends. If something is wrong, we handle it correctly and quickly from our warehouse. We Know Saniflo, we have the best employees in the business who know the product inside and out and we give the best deals in the business. * No Other Saniflo Seller Can Compete With Us! Take 5 minutes and give us a call. * We Know Saniflo! We are a Factory Authorized stocking distributor, unlike many people selling online we actually have our stock in our facility. * Can the pump be hidden? Yes, you can use our extension pipe to hide your macerator/grinder behind the wall. Highly recommended if you have the space. * Commercial Customer? Call Erin or Mark for special volume pricing. * 3 Year Warranty on All Saniflo Pumps,. **You must register your new system with Saniflo or the Standard 2 Year warranty will apply! Be sure you buy from a Factory Authorized Distributor or the warranty may be void. * Are Saniflo Bathrooms safe for Septic systems? Yes.....We can send the full Saniflo case study if you want some easy reading. * WHAT IS YOUR FAVORITE SYSTEM? Our favorite Saniflo system for a full bath would be the Saniaccess 3, half bath a Saniaccess 2. I personally have a Sanibest Pro which is fantastic, but for most situations save the money and go with the Saniaccess 3. 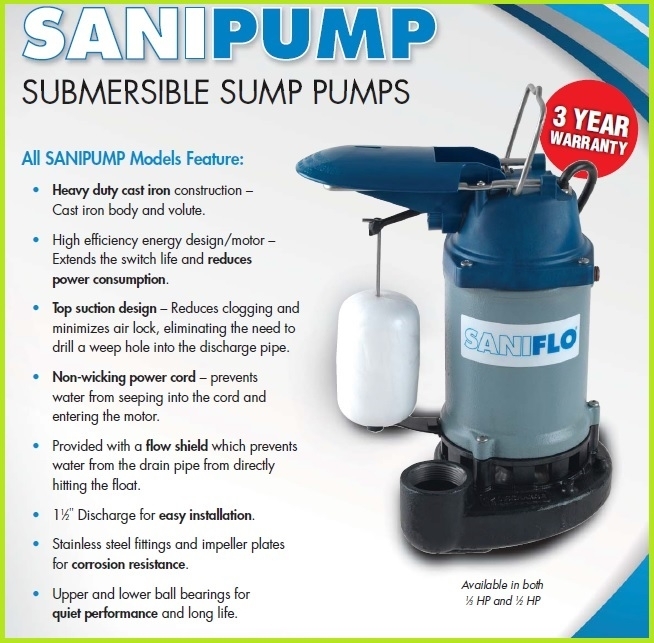 Saniflo SANIPUMP 1/2 hp submersible sump pump, 56 years of quality packed into this heavy duty sump. This heavy duty pump is definitely not a big box store unit, max lift 25ft 70GPM. Better quality, better price and absolutely the best service. The best part about this pump is that it draws only 4 amps which is ideal for a battery back up situation.